Radiolabelling is a technique that uses minute traces of radioactivity to track and locate tumor cells. Credit: Ella Maru Studio. Is it cancer or is it a benign tumor? That question is often answered by invasive techniques like biopsies that involve needles or tubes to reach and remove a piece of tissue for closer study. However, accurately diagnosing and treating cancer may soon be possible without a biopsy, thanks to researchers at Western University in London, Ontario. A team led by Dr. Len Luyt, a professor with the departments of Chemistry and Oncology, has developed a new class of imaging agents targeting the prostate. Molecular imaging using trace amounts of radioactive metals or dye administered by injection or patch would provide a detailed picture of what is happening in the prostate, allowing for a more accurate detection of tumors. “We are a synthetic chemistry laboratory, and our research program involves the design, preparation and evaluation of new compounds for the imaging and treatment of cancer,” says Luyt, who is also a Senior Scientist with the London Regional Cancer Program. By adding radioactive metals into peptides that target tumours, cameras are able to locate a tumour without a biopsy. Having his research group embedded within a cancer research lab helps bring to light what he calls “unmet clinical needs,” such as the need for a diagnosis without a biopsy. That close connection also came into play with a project related to breast and other cancers likely to metastasize, which previously had no known molecules that would target them. Peptide receptors are located on the surface of tumor cells. Luyt’s colleague at the London Regional Cancer Program and Western Oncology, Biochemistry and Surgery professor, Dr. Eva Turley, discovered a new one called RHAMM (receptor for hyaluronan-mediated motility). This is a protein in humans that regulates cell movement and stem cell differentiation and is overexpressed in breast cancer. Luyt and Turley received the 2016 WORLDiscoveries Vanguard Award for Innovator(s) of the Year for their work with RHAMM to selectively stimulate fat growth under the skin, moderate inflammation and reduce scarring by controlling the body’s own natural regenerative processes. Researchers continue to advance RHAMM-based technologies to find treatments for a variety of inflammatory conditions, including emphysema, arthritis and bronchopulmonary dysplasia, a form of chronic lung disease in premature infants. On the chemistry side, the team works on technological advances for discovering compounds that target cancer. This includes methods to add radioactive metals into peptides that target tumors, which allows an external camera to view an image of the tumor. Applied projects with a specific cancer application, such as diagnosis or treatment related to prostate or breast cancer. 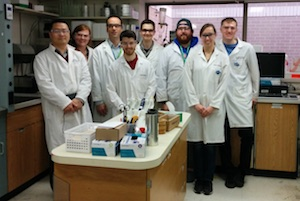 Professor Len Luyt, third from left, and the Western Faculty of Science graduate students are working to translate scientific discovery to clinical use. 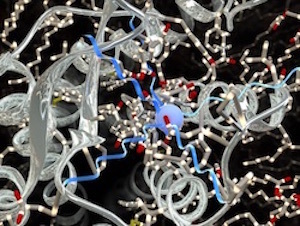 Luyt’s team screens millions of different compounds to see which will interact with the cancer target, developing large “libraries” of peptides. Peptides play an important role in the body as hormones and neurotransmitters (relaying signals from one nerve cell to another). 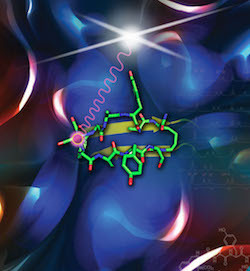 Luyt and Turley started a research project to find the peptides that would target RHAMM, discovering new molecules that bond well. The molecules show great potential as a drug and the team is working with a pharmaceutical company to move to clinical trials. “This is an example of how chemists are able to collaborate with cancer scientists to move an academic biology discovery forward,” Luyt says. Luyt appreciates the involvement of both undergraduate and graduate students from Western’s Faculty of Science, including its graduate program in molecular imaging, the only program of its type in Canada.